Food: I made pumpkin soup and it turned out SO DELICIOUS! Pumpkin, celery, cauliflower, garlic, veggie bullion, sage, a little earth balance margarine. YUM. I just did 20+ minutes, but it was midnight, so, couldn’t hope for much more than that! 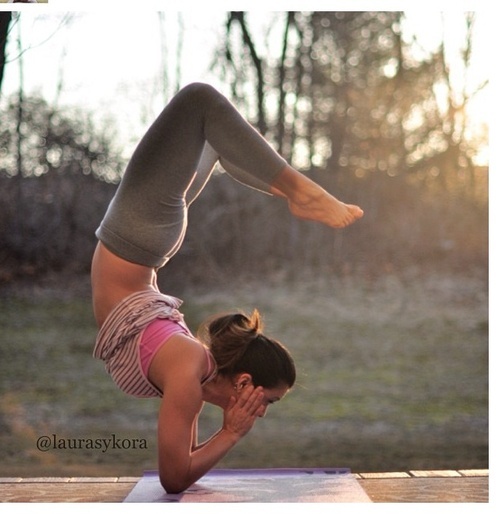 I practiced Scorpion Pose again, and really found a point of balance! I noticed I could balance best with my eyes facing the floor, I think because it’s more similar to headstand that way. I stayed pretty stable looking forward, but it wasn’t as solid. Anyway, tonight may be the longest I’ve held the pose so far. Exciting!! 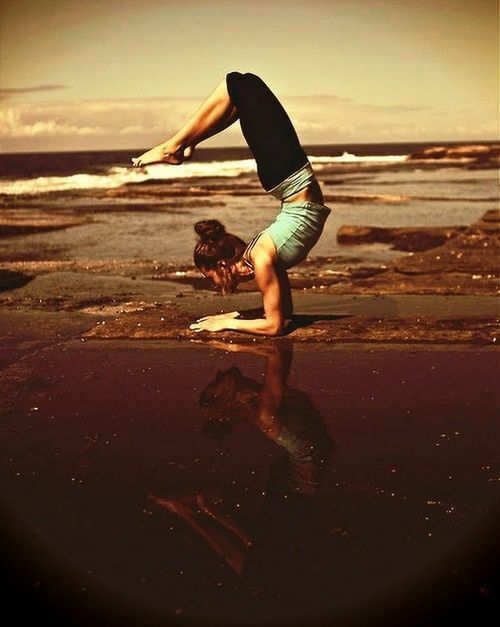 I haven’t done Vinyasa in a LONG time, that will be next on my list! This is an alcove in my bedroom that is about 5×6, and it’s where my queen sized bed has always been. A couple of weeks ago I bought an air conditioner for the first time in my life, and when my attic bedroom hit 88, I turned it on. What I quickly discovered was that I couldn’t sleep with it right next to my bed. It was way too loud. And too cold. So I had to choose between moving the AC, or moving the bed. I can’t really move the AC by myself, so the next time I ended up pushing the bed out, just to be able to sleep. Today I decided to just go for it! And the room rearranging began. I moved a few other things out, a night table, and bookshelf that I used as a headboard. And I moved the bed against the other windows in the middle of the room. And voila!! 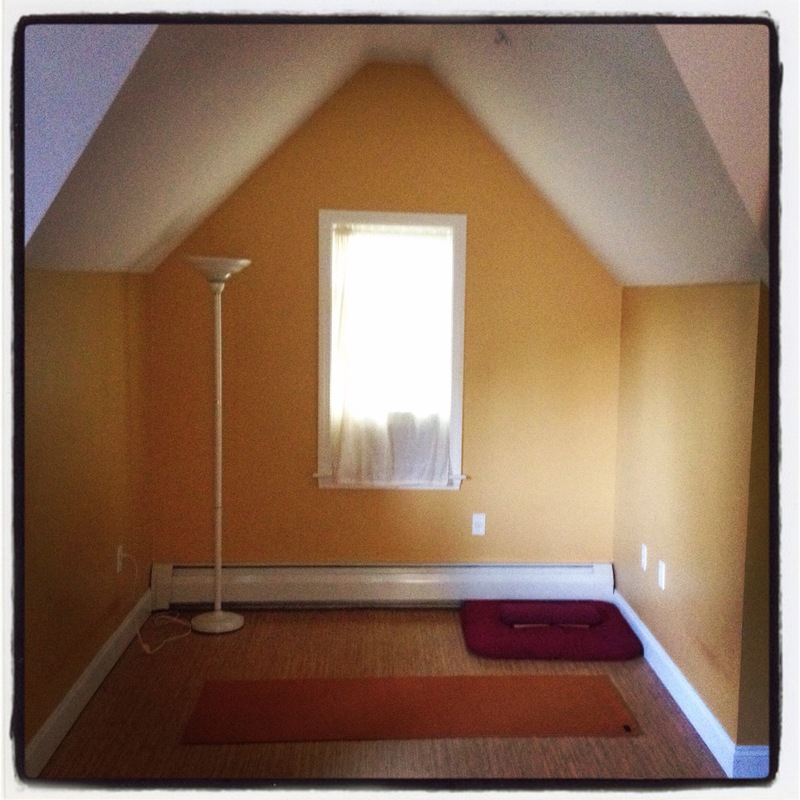 A yoga nook! The rest of my room is now a bit of a cluttered mess while I figure it out. I’d like to get rid of a lot of it, or at least hide it better. So, I thought before I write about my yoga space, I’d better use it!! 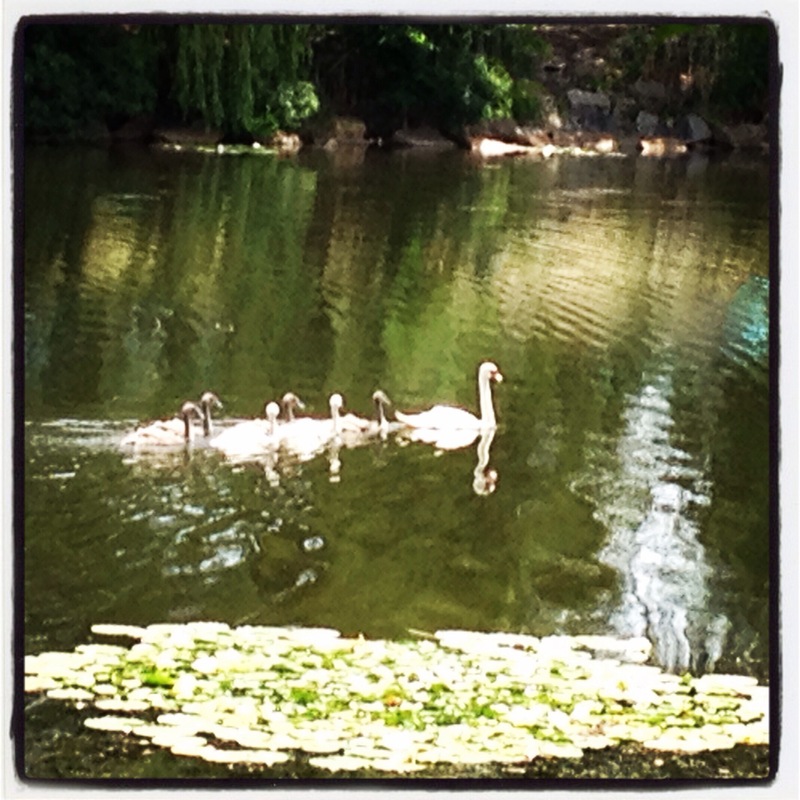 I walked for an hour at lunch today (saw the swan babies again, they are getting big! ), then ran around the pond tonight for 24 minutes (hurray! ), then came home and did some yoga for 20 minutes. It felt great! And I practiced Scorpion Pose for a few minutes! It was nice to be in that space, even though it still feels a little sterile. I’ve already added a plant, but feel like it needs more. This is likely a very temporary arrangement, I’m not sure I like it. Now, instead of having my big bed tucked away in a corner it’s right in the middle of the room. But I’ll give it some time, maybe a month or two, and see what happens! Maybe it really will inspire me to do more yoga! Remind me that it is a priority for me. The goal in this year of blogging is to live this precious life with intention, and I really felt like I did that today. It was a beautiful day. Not extraordinary, but just good. I had my lunchtime meditation group at work, and with all the people traveling, on vacation, or wanting to spend time outside in this gorgeous summer weather, I didn’t have anyone come today. Which was fine by me! I did 2o minutes of silent meditation, and 20 minutes of yoga! Right there at work, in one of the conference rooms, with the blinds down. It felt pretty funny, and wonderful to practice my scorpion pose right there at the office. I actually found a sweet spot and was able to relax into the pose and balance. It was great!! Very encouraging and motivating. I actually packed a breakfast and lunch, a big bottle of green smoothie, organic steel cut oatmeal with raisins and cinnamon, brown basmati rice with curry, and split yellow pea dahl (which I’ve been eating for a week.) The dahl and the steel cut oats were both cooked in my crock pot, so easy! I’ve got to try to do some more recipes for that. It’s quiet this week at work so I spent some time organizing my electronic files which I usually put off, and it felt very satisfying to get organized. When I got home I made my son turn off the TV and asked him what he wanted to do. We had some one 0n one time because my daughter is spending the night at a friend’s house. 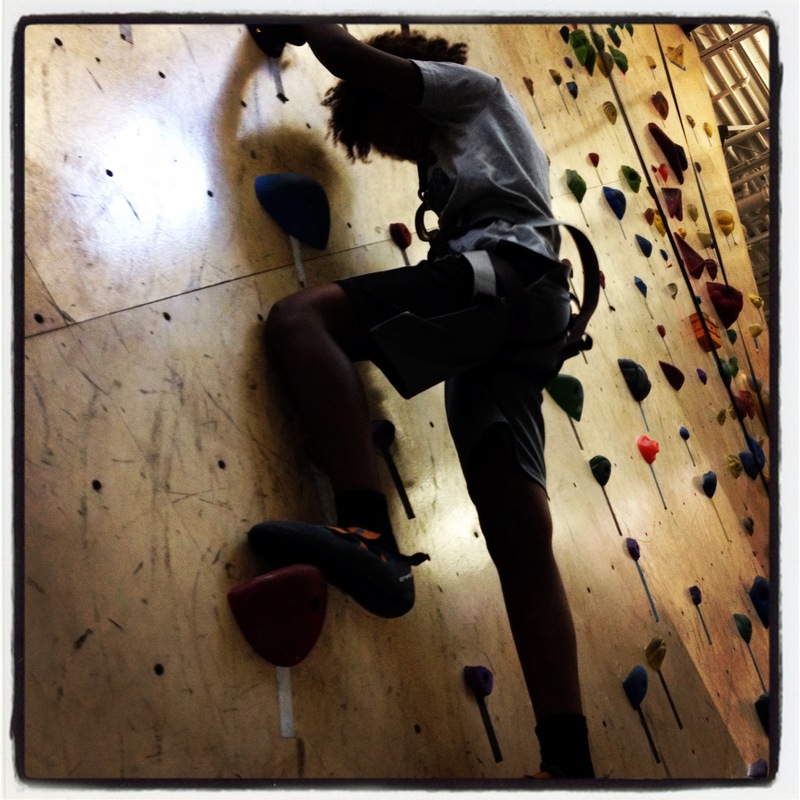 I asked if he wanted to go to the pool, or come with me to gym because I had signed up for Zumba, but he totally surprised me and said, Let’s go rock climbing. So we did! He is just as afraid of heights as I am, so I’m not sure what inspired him, but we had a really good time. It’s not very often we do something like that together, just the two of us. We also had dinner at home with homemade sushi! His idea. He was thrilled because it’s his favorite food, and I was happy because I’ve been trying to prepare more food at home and save money. 365 Challenge Day 42 – Scorpion Pose!! I love that quote. Yes, I should have been practicing this all along. But, I haven’t been. So, nothing else to do but start again and start now!